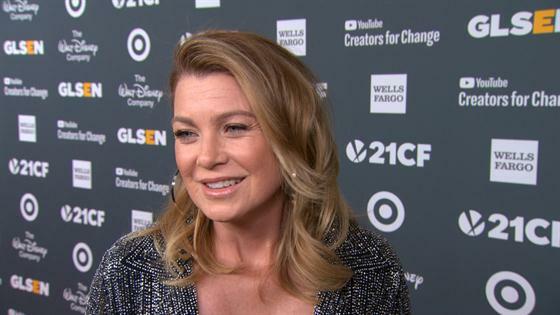 Ellen Pompeo's exit from Grey's Anatomy isn't nigh…just yet. Pompeo made headlines when she told EW it might be time to hang up her stethoscope and say goodbye to Meredith Grey following season 16 (the last she's currently contracted for, ABC has yet to officially order the season). "I'm clearly not prepared right now to make any kind of formal announcement about what my future is on the show, but I am really feeling like we have told the majority of the stories we can tell," Pompeo said. "It's about time that I mix it up. I'm definitely looking for a change." However, rumors of her exit, which seem to have kicked up again thanks to a blind item, are just that right now. "I take it day by day and season by season," Pompeo told E! News at the 2018 GLSEN Respect Awards. If and when Pompeo decides to call it quits with Grey's Anatomy that'll be the end of the show, series creator Shonda Rhimes has said. Pompeo was on hand to receive the Inspiration Award. Rhimes presented it to her for her advocacy work on behalf of marginalized communities and people. "It's humbling to say the least," Pompeo said about the honor, noting the kids who are on the ground making efforts for change. "These kids are the ones who are suffering," she said. Click play on the video above to hear more from Pompeo.